Are tattoos safe? | Science or not? Let’s check the science: Are there any adverse health effects from tattoos? A while ago, some of my family told me about someone sitting next to them in a coffee shop who had tattooed eyeballs. Yes, the whites of his eyes were not white, but coloured. I’ve noticed, too, that large, colourful tattoos are becoming increasingly popular. This concerns me because I’m not sure about their safety. It’s not the small risk of infection during the tattooing process that bothers me. My concern is that tattoos involve injecting into the skin substances that are foreign to the human body, and that these presumably stay there for an entire lifetime. I was trained as a chemist, and I know that some pigments are pretty nasty as far as toxicity goes. At a time when many people go to great lengths to avoid ‘chemicals’ in their environment or food, how can others have them inserted into their skin? What are those substances and are they safe? It seems there’s not a great deal of concern in the tattooing community about the actual ingredients of tattoo ink. This surprises me since there is high awareness of the possibility of infections and the need for sterile practices. Perhaps this situation arises from the appeal to ancient wisdom – assuming that because tattooing is an ancient art, it must be safe. Ink producers (here, here, here) insist that they place great importance on safety of pigments and most of them acknowledge that health authorities (such as the FDA in the US) do not have lists of approved pigments. Some of them like to mention the fact that the authorities approve pigments for foods and cosmetics and they imply that this makes them safe for tattooing (here). Some claim that they are moving away from inorganic pigments to organic ones which are safer. There are lots of websites from health authorities warning about the possibility of infection and allergic reactions from tattoo ink (here, here, here). That’s not my main concern here. What I want to examine more closely are the claims of risks resulting from such things as heavy metals (like cadmium and chromium), phthalates, polycyclic aromatic hydrocarbons (PAHs), and N-nitrosamines (here, here, here, here and here ). There are also concerns that the wide variety of pigments used and lack of regulation means there is potential for problems (here). I come from a generation in which tattoos were regarded as a bit suspect. And I don’t like the fact that many tattoo parlours in Australia are associated with bikie gangs. I think I can assess the health issue impartially, but I could have an unconscious bias and it could interfere with my evaluation. I could fall into errors through the influence of confirmation bias or the anchoring effect or cherry-picking. I need to be aware of this and you need to monitor what I write with the possibility in mind. Admittedly, any bias I may have retained should have dissolved when I discovered that the excellent science journalist Carl Zimmer has written a book called Science Ink: Tattoos of the Science Obsessed (excerpts here and here), a collection of science-themed tattoos and their stories. He also contributes to the Tattoo Emporium, a section of the National Geographic blog The Loom. Evidently, there are lots of very scientifically literate people who are not phased by the presence of toxic tattoo inks. I imagine at least some of them (like the person on the right, who obviously knows a bit of chemistry) would have done some research into the risks. Nevertheless, I still need convincing that these substances don’t cause any harm when they are so intimately inserted into bodies. In tattooing, tiny particles of pigment are injected into the part of the skin called the dermis, where they are taken up by cells called fibroblasts (see here). Tattoo inks contain at least a pigment and a carrier. The composition of pigments varies greatly (here, here). Most traditional tattoo pigments were based on inorganic compounds with low solubility – salts of metals such as iron, titanium, cadmium and copper. The notable exception here is black pigment, which usually consists of fine particles of carbon. Some heavy metals are toxic if absorbed by the body (here). A 2001 analysis (here) of tattoo inks from a single manufacturer found none that contained lead, cadmium or mercury, but it did detect titanium, copper, chromium and iron. A 2009 Italian study (here) analysed 13 inks from a single supplier and found the heavy metals cadmium, cobalt, chromium and nickel in all of them. Most of the inks also contained mercury. A 2010 analysis (here) of black inks based on carbon found that most of them contained polycyclic aromatic hydrocarbons (PAHs) which are known to be carcinogenic. There is a trend away from inorganic pigments to organic compounds. (Note: ‘organic’ is used here in its chemical sense of ‘based on carbon’, not in the popular use of ‘produced without any nasty influences’.) A 2011 Swiss study of 190 inks (here) found that inorganic pigments (apart from black carbon and white titanium dioxide) had virtually disappeared. There is concern about the safety of many organic pigments (here, here). Pigments that are banned for use in cosmetics have been found in tattoo inks (here, here). Carriers can be liquids such as distilled water, ethanol, isopropyl alcohol, glycerine, propylene glycol, witch hazel and others that could be harmful (here). However, the amounts are small and they would not be retained in the skin. The body’s normal waste-disposal processes would deal with them and any effects would be short-term. Very few countries have any regulations controlling the composition of tattoo inks. Most have regulations covering colourings used in foods and cosmetics. These do not apply to tattoos, but some tattoo ink suppliers make reference to such regulations to imply that their products are safe. The wide variety of pigments used and lack of regulation means there is potential for harmful consequences (here, here). A Danish study (here) could find no manufacturers that produced pigments or dyes specifically designed for tattooing. Normally they are intended for industrial colouring in printing inks, paints, plastics, textiles, soap and food (here, here). Most colourings are produced in different grades, having different purities. Food cosmetic grades have the highest purity but it is possible to buy identical colours in a less pure grade. It’s not easy to find MSDSs for tattoo inks. One ink manufacturer has online access to MSDSs here. Unfortunately, the MSDSs seem to me to be based mainly on the bulk properties of the carriers rather than those of the pigments. They are useful for people who may be handling quantities of the inks, but they don’t give any indication of long-term effects of the pigments in the body. Pigment manufacturers base their safety information on the assumption the pigments will be used for industrial purposes, not for tattoos (here). Although there have been cases of cancers reported in tattooed skin (here, here, here), this would be expected by chance, and there is no evidence of any link between tattoos and skin cancer (here, here). Pigment can travel from tattoo sites and collect in lymph nodes. Although this is not in itself harmful, there are many reported cases (here, here, here) in which the pigment had been mistaken for metastatic melanoma. Obviously, millions of people have carried out their own personal experiments with tattoos. Although some people suffer allergic reactions from inks, there doesn’t appear to be any evidence of long-term harm. I have to withhold judgement in this case. On the positive side, I couldn’t find any evidence that tattoo pigments are responsible for serious harm. Certainly, there are problems, such as allergies, but there is no evidence of generalised toxic reactions. On the negative side, there is no evidence that the newer synthetic pigments are safe. Many of them have been used for only a short time, they are not produced specifically for tattooing, and their use is not regulated. If I were thinking of a tattoo (which I’m not), I’d stick to black pigment, which would most likely be good old low-risk carbon. I’d steer clear of colours, whether the old metallic varieties, or the new organic ones. The FDA investigation might end up giving them all the thumbs-up, but I wouldn’t count on it. And an eyeball tattoo? No way! Update 2014/04/30: In a video at The Conversation, Professor Rodney Sinclair and Dr Philip Bekhor explain how laser tattoo removal works. They point out another advantage of sticking to black tattoos – they are the easiest to remove. To dye for? Jury still out on tattoo ink causing cancer by Ian Olver at The Conversation. Trend for larger tattoos masks a deeper problem of toxins and the skin by Desmond Tobin at The Conversation. Main image: Tattoo Arts Festival in Pattaya, Thailand is by Binder.donedat on flickr. 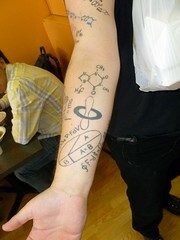 The Chemistry tattoo image is by benchilada on Flickr. Thanks Peter. This is interesting. I can’t find any reference to published papers though. Thanks Jona. And for contributing the nifty hook as well. Here’s two articles you might be interested in. Thanks Caillin. The second one is particularly interesting. Lovely article, but you did not mention anything about being able to donate blood. Can one who has tattoo’s’s on their body still donate blood. « What if there were a 95% chance a comet would collide with earth in 30 years?